(Reuters) - Soldiers took over the headquarters of Zimbabwe’s ZBC state broadcaster in the early hours of Wednesday, two members of staff and a human rights worker said, compounding speculation of a coup against 93-year-old President Robert Mugabe. 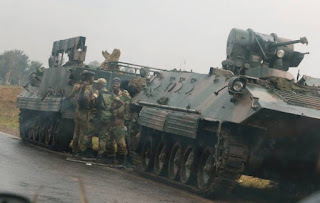 Some ZBC members of staff were manhandled when soldiers occupied the premises, the sources said. However, staff were told they “should not worry” as the soldiers were merely there to protect the site, one source added.